LOUIS P. CROSIER is a Principal at Windward Investment Management and serves as a member of Windward’s Investment Committee. His responsibilities include managing client portfolios and overseeing the firm’s investment consulting practice. Prior to joining Windward, Crosier worked in the investment management and consulting industries, most recently as a vice president in the Private Client Group at Goldman Sachs. His experience includes advising clients with regard to single stock risk management, asset allocation, portfolio construction, and manager selection. Prior to Goldman Sachs, Crosier worked as a manager of business development and product manager at Cambridge Energy Research Associates, an international energy research and consulting firm. Crosier earned a BA in French literature and psychology at Dartmouth College, a master’s in education from Harvard University, and an MBA from the Amos Tuck School. Foreword (Edward I. Rudman, Co-Founder and Chairman, Pell Rudman, now Atlantic Trust Pell Rudman). 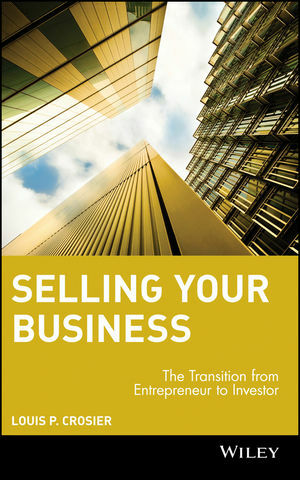 Part I: Before Selling Your Business. Chapter 1: Pre-IPO/Presale Planning (William R. Fleming, Director; and Daniel Carbonneau, Senior Manager; with Richard L. Kohan, Partner, PricewaterhouseCoopers). Building a Professional Service Team. Chapter 2: Trust and Estate Basics (A. Silvana Giner, Senior Partner; and Kimberly Cohen, Junior Partner, Hale & Dorr). Complex Wealth Transfer and Estate Planning Issues. Chapter 3: Life Insurance: From the Basics to the Advanced (Herbert K. Daroff, J.D., CFP®, Baystate Financial Services). Buying Term and Investing the Difference, but in a Tax-Advantaged Manner. How Your Money Gets Invested. Assessing Cash Value During Lifetime. Selecting the Right Premium Amount. Selecting the Right Premium Payer. Who Should Own the Insurance? Chapter 4: Negotiating the Deal (F. George Davitt, Partner, Testa, Hurwitz & Thibeault; and Barry Nalebuff, Ph.D., Milton Steinbach Professor of Management, Yale University School of Management). Selling Rather Than Going Public. Sale for Cash or Stock. Part II: After Selling Your Business. Chapter 5: How Your Life Changes: Psychology of a Windfall (Marty Carter, Family Wealth Counselor, Charles D. Haines LLC; and Charles W. Collier, Senior Philanthropic Advisor, Harvard University). Impact of the Sale on the Entrepreneur. Impact of Wealth on the Entire Family. Chapter 6: Overview of the Wealth Management Industry (David M. Spungen, Managing Partner, Hillview Capital Advisors). How to Evaluate Wealth Management Firms. Chapter 7: Managing Concentrated and Restricted Stock Positions (David N. Elan, CFA). Restricted Stock and Equity Risk Management. Public Policy and Rule 144 of the Securities Act of 1933. Negotiating with Broker-Dealers and Finding the Best Counterparty. Chapter 8: Asset Allocation (Stephen J. Cucchiaro, President and Chief Investment Officer, Windward Investment Management). Chapter 9: Developing an Investment Policy Statement (Ramelle M. Hieronymus, Principal, Prime, Buchholz & Associates). Sample Statement of Investment Objectives, Goals, and Policy Guidelines. Part III: Investing for the Long Term. Chapter 10: Selecting Investment Managers (Paul Greenwood, Director of US Equity Investment Management & Research, Russell Investment Group). Chapter 11: Risk: How Much Should You Take? (Paula Boyer Kennedy, CPA, CFP®). Risks of Specific Asset Classes. How Do You Maximize Return While Minimizing Risk? Chapter 12: Fixed Income (Peter B. Coffin, President, Breckinridge Capital Advisors). Duration—A Portfolio’s Sensitivity to Changes in Interest Rates. Credit Quality and Default Risk. Chapter 13: Global Investing (Lindsey A. Richardson, Principal, State Street Global Advisors). Theoretical Benefits of Non-U.S. Investing. American Depository Receipts versus Local Stocks. Chapter 14: Real Estate (Nicholas Bienstock, Managing Partner, Savanna Partners; with Laura Corwin Burkhart, Founder, Slate Capital). Chapter 15: Private Equity (Sallie Shuping Russell, General Partner, Intersouth Partners). Types of Private Equity Investments. Chapter 16: Hedge Funds (DeFred G. Folts III, President, Mettowee Capital Advisors). Different Types of Hedge Fund Strategies. Risk-Adjusted Rates of Return Among Hedge Fund Strategies. Variability of Returns Among Hedge Fund Strategies. How to Think About Incorporating Hedge Funds into a Portfolio. How to Invest in Hedge Funds: Funds of Funds versus Individual Managers. What to Look for in a Hedge Fund Manager. Chapter 17: Performance (Robert E. Phillips, Ph.D., President, R.E. Phillips Systems). Comparative Evaluation of Investment Performance. Chapter 18: Ongoing Management and Accountability (Douglas Ederle, Managing Director, SCS Financial and; Todd Millay, Partner, CCC Alliance). Range of Structures for Ongoing Management. Basic Monitoring Criteria for External Providers. Reviewing Your Provider’s Peformance over Time. Chapter 19: Philanthropy and the Venturesome Donor (Stephen P. Johnson, Vice President, The Philanthropic Initiative). Giving Well—Qualities of Effective Philanthropy. Conclusion—Getting It Right: The Key Decisions You Will Make (Louis P. Crosier).